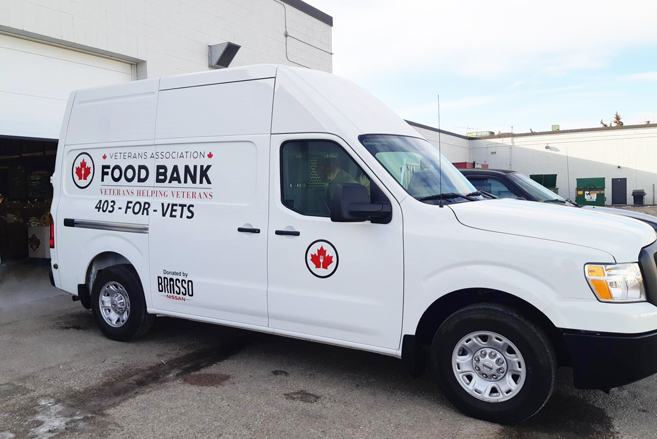 Helping veterans serve their community with an NV Cargo Van. 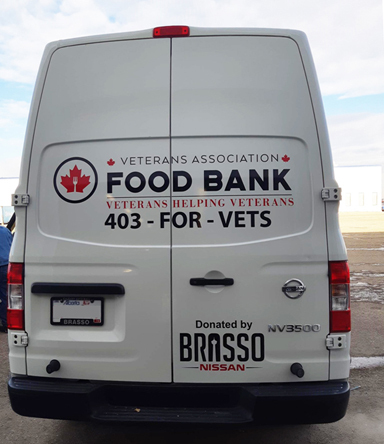 The Veterans Association Food bank opened in October, and Calgary now has a new food bank run by veterans, for veterans. Donations can be dropped off at Bay 14, 2916 5th Avenue N.E. 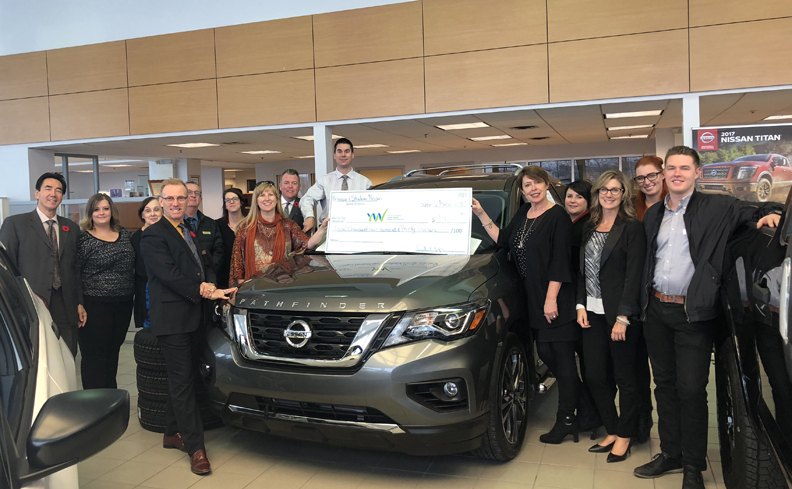 Staff gathered in the showroom on November 6th, 2018, to present Robyn Jackson, Senior Development Officer, from the YW CALGARY with a cheque for $9,430. 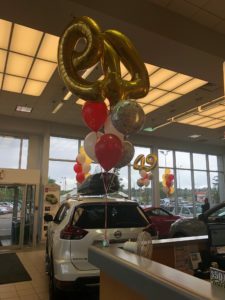 The funds were raised from the annual Brasso and Stadium Nissan charity golf tournament and our Anniversary Sales Event in June. 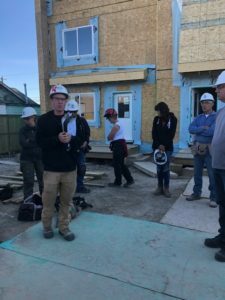 We’re hoping to break the $10,000 mark in 2019! Giving back to the community that has supported Brasso for almost half a century is important to us. That’s why we named June as the month of giving. 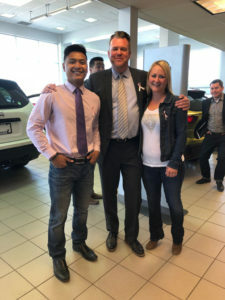 Partial proceeds from every vehicle sold during our Anniversary Event, as well as from a tasty and very rainy BBQ, were donated to YW Sheriff King Home crisis shelter. We are thrilled to announce we raised $3,500 for this vital organization. Family violence is the single largest woman’s health issue in Canada, with more reported cases than heart attack and stroke. It affects women of all races, ages, socio-economic classes and educational backgrounds – and in many cases, it involves children. Domestic abuse has steadily been rising in Calgary over the last few years with showing 34% more incidents of domestic violence than the 5-year average. In fact, police responded to 3,089 domestic violence calls in the first three quarters of the year. 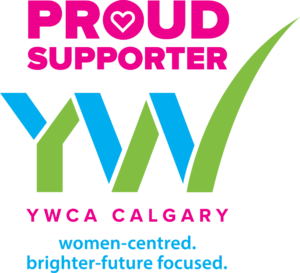 In 2017, YW Calgary helped more than 770 women and children through our family violence programs and services. Each year the Brasso team looks forward to participating in the ‘Adopt-a-Day’ build. 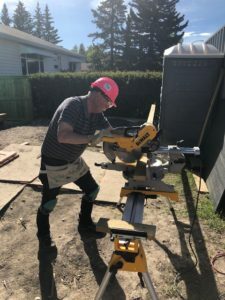 On June 13th, we spent the day in the Bowness neighbourhood.working on new homes for families in need. 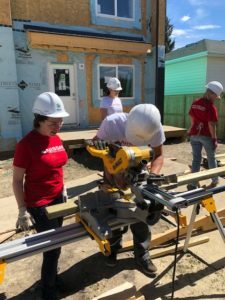 A big thank you Nissan Canada Foundation for another fabulous experience. 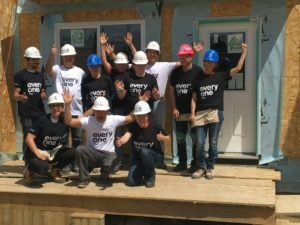 We are so grateful to have had the opportunity to make a difference in the Calgary community! Brasso is proud to be a sponsor of the Rainbow Society’s 2018 Evening of Wine & Wishes event June 7, 2018. The Rainbow Society of Alberta grants wishes for children between the ages 3 – 18 who are diagnosed with a severe chronic or life threatening medical illness. This year the epicurean adventure will be held at Workshop Kitchen & Culture and the goal is to raise $15,0000. 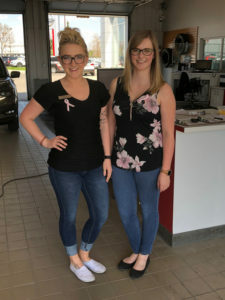 The Rainbow Society grants wishes grants wishes throughout the province to children who have been diagnosed with severe chronic or life-threatening medical illnesses. Click here for more information on this amazing organization. 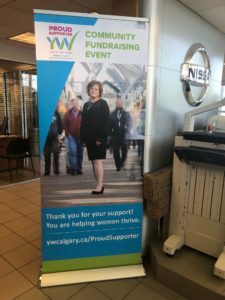 Brasso Nissan was proud to be a Sponsor of the Brenda Strafford Society Gala Event on March 8th, 2018, International Women’s Day. 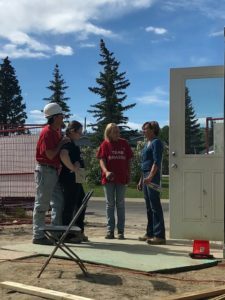 The Brenda Strafford Society’s mission is to create a safe environment for women and children impacted by domestic violence and to provide support services that prepare families to safely return to the community and be able to heal so they can independently support their families in a violence free setting. 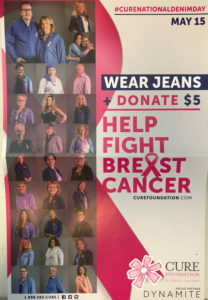 What could be better than wearing jeans to work in support of National Denim Day on May 15, 2018? 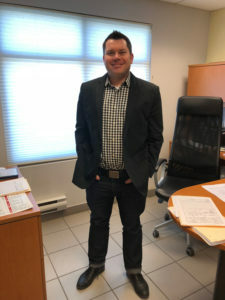 Wearing jeans to work every day! Unfortunately, that’s not possible, so Brasso staff members are eagerly looking forward to participating in this annual event. 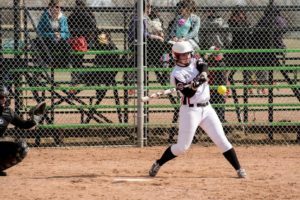 Calgary Rogues Fastball is a young women’s fastpitch/softball club made up of high school and college/university players. 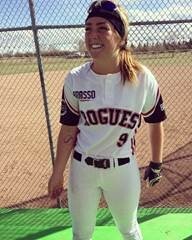 The Rogues play in the Calgary Women’s Fastpitch Association, which runs from April to July. 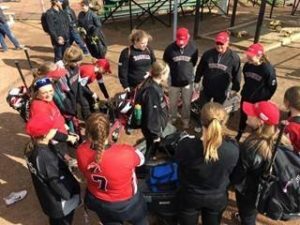 Established by the coaching staff of the SAIT Trojans, Calgary Rogues Fastball will give these athletes a place to play during their off season and also grooms high school athletes for potential college experience. 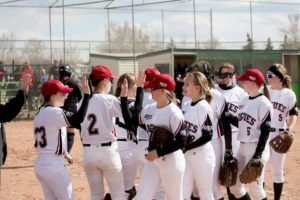 Calgary Rogues Fastball is dedicated to giving young women the best in coaching and training; building dedication and discipline within an environment of respect, good sportsmanship and fun. Go Rogues Go!